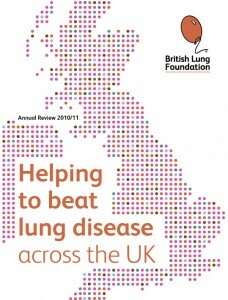 Soon after editing the British Lung Foundation’s (BLF) member magazine, the organisation commissioned me again to write their 2010/2011 annual review. To sort through information from several BLF departments and regional offices about their achievements in 2010/11, decide what the annual review should include and omit, come up with a structure for the publication, interview case studies, then write 44 pages of concise, compelling copy. The annual review had to appeal to a wide range of audiences, from funders to individual supporters, but it had one key aim: to show the BLF’s impact above all else. An annual review with every word focused on the difference the BLF makes to the lives of those affected by lung disease.